Second Annual School Supply Drive! All proceeds will benefit UMFS foster kids for the coming school year! You’re probably asking, “Well, when is it? !” and we’re glad you asked! Read on, friends! What: Second Annual School Supply Drive barbecue in the park! Who: Flying High In-Home Tutoring, UMFS, and you! Why: to benefit UMFS foster kids! How: Tickets are just $5 in advance. Kids 3 and under are free! Each includes a BBQ lunch and a raffle ticket. You can bring school supplies to donate to earn even more raffle tickets! We will post updates and raffle teasers to the event page! Gardening with Kids: Grow a Love of Learning and Nature! Grow a Love of Learning and Nature! Campaigns in both the United States and the United Kingdom have worked to bring gardening back into the school curricula. The results have been fruitful! Gardening encourages and expands children’s desire to learn and boosts their confidence in many ways! Promote Concentration: Because gardening puts them in a situation where they engage in their work with their entire body (and mind! 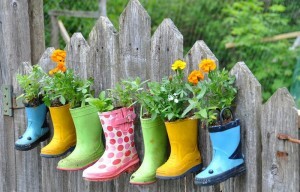 ), kids who garden show an enhanced ability to concentrate on their tasks. Who wouldn’t want better focus for everything we do? Better concentration gives extra power to study skills and defense against distraction. Work is Healthy! Gardening can help to use up extra energy in especially active kids. Awaken Creativity! After working in a garden, students have found to be more creative in writing and artistic tasks. Life Skills: Kids learn responsibility by caring for a living organism on its life journey from seed to flower (or veggie or fruit). Teachable Moments: We might automatically think of science skills when thinking about gardening, especially principles like photosynthesis and nutrition, but gardening spans so many school subjects and life skills. Students can combine reading, math, and planning abilities in preparing their garden. Each plant is unique and comes with its own preferred environment and care from its sun and water requirements to plotting and soil setting. Get Your Hands Dirty! Learning and being outdoors is good for mind and body, but being down in the soil can even help kids overcome fears. Even the most insect-phobic child would like to see butterflies, and certain kinds of gardens attract them! Perennials are plants that persist for many growing seasons, but when planted from seeds, they will not bloom until the spring or summer of following year. Annuals are plants that complete their entire life cycle in one season, but they tend to produce more flowers and bloom for a longer period of time. When the plant dies off, you can save the seeds for next year! Planting a vegetable or herb garden is a rewarding experience! Snap peas, tomatoes, cucumbers, and pumpkins are easy, low-maintenance plants. Herbs like oregano, parsley, mint, and thyme grow well in garden beds and planter pots alike. Choose a space that gets at least six hours of sunlight each day. Butterflies are attracted to flowers so they can feed on nectar. Popular perennials include sunflower, butterfly weed, phlox, and purple coneflower. 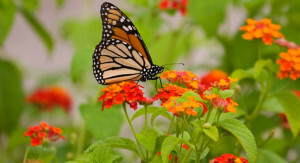 Annuals are great because they attract butterflies all season and include petunias, zinnias, lantana, and verbena. Provide for all life cycles of the butterfly by including some leafy shrubs where butterflies can lay eggs and caterpillars can eat! These include lilac and butterfly bushes. Lamb’s Ear is a plant that has soft, fuzzy leaves that kids will love to touch. Lavender, marigolds, and herbs are very fragrant. Wind chimes, water fountains, and birds in your garden add sound and interest. You can even plant a garden on the patio! Tomatoes, herbs, annual flowers, and even many perennials do just fine in pots. Let kids get creative with ideas for containers. Anything that holds soil and has drainage can work as a planter pot! TIP: Kids work best with garden tools that are appropriate for their size. Save the plastic tools for building sand castles. Upcycle some old, large kitchen spoons or measuring cups for digging so kids can work with sturdy tools that are easy to handle. DID YOU KNOW? Butterflies are cold-blooded animals that can’t regulate their body temperature on their own, and they can’t fly when they’re cold! They need a body temperature of at least 85 degrees to fly! Providing a large, flat rock that gets sunlight will provide butterflies a place to bask where they can warm up on cooler mornings! Standards of Learning (SOL) test scores are ready. Parents should have received a letter stating whether or not your child passed the SOL. How did they do? We’ve had students come to us in the past with decent and even high grades in the classroom, but had difficulty passing the SOL. High grades in school are not the only mark to understanding. Just one of our bright students last year was able to pass the SOL after 4 tutoring sessions. Helping students understand content allows them to not only increase SOL test scores, but also develops a healthy foundation for future courses. Don’t hesitate to call us. More rigorous standards for English, Math and Science that have been implemented in recent years have left some gaps in learning and preparation that we are happy to fill. Progress reports are coming out this month. You don’t have to wait until receiving progress reports to get help. Speak to the student and the teacher to see how things are progressing. The earlier issues are addressed, the greater the outcome. It is still early in the school year to maximize the best grades for students. Many times as a community of learners, we focus on instilling the importance of enhanced learning to students. We must also focus on the importance of persistence. Academics, just like life circumstances, have challenges that are worth working through. “Giving up” has a high failure rate, but with persistence also come success. However, sometimes success may be gradual and the process may be frustrating. Here are 5 basic tips that can help develop persistence in students. Ask your child questions: “What do you think you need to do to…” “How can you…”. Try to stay away for “why” questions. Recognize the process or specific steps taken to achieve accomplishments rather than just congratulating the accomplishment itself. Be an example. How can you display persistence in your life when things get tough? For training on each tip and more tips, contact us to schedule a free “Persistence: Basic Steps, Large Outcomes” work shop with your PTA, civic organization, church or just a group of friends wanting to improve their child’s success.